Experience one of the most exciting and family friendly things to do in Glacier National Park! Join us and explore 50 different ropes course and highline adventure activities. Find your adventure on the river and on the highline! Spend half the day whitewater rafting the Middle Fork with Glacier Raft Co, and then join us on our aerial adventure park! Wake up and adventure right from your Glacier Park home-away-from-home! All lodging is located just minutes from the west entrance to Glacier Park and Glacier Highline. Glacier Highline offers the ultimate treetop adventure with over 50 different highline and ropes course activities, including Ziplines, Burma Loops, Log Walks, Cargo Nets, a Giant Swing, Rock Climbing Wall, and the Tarzan Swing. 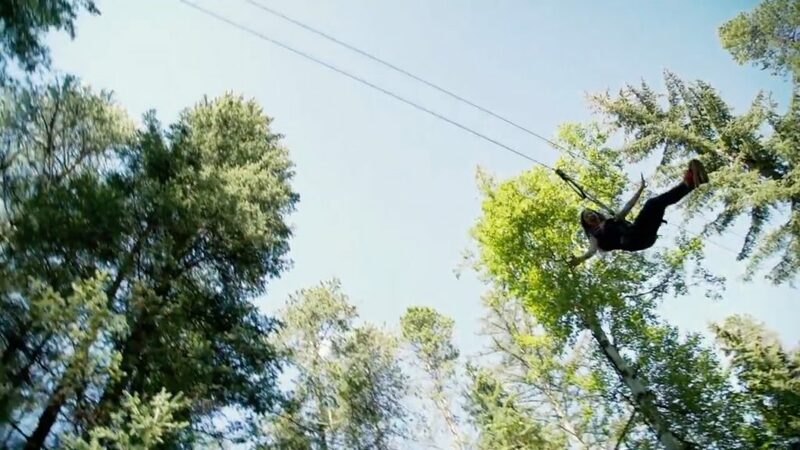 Located in the Flathead Valley, Glacier Highline is the perfect spot to zipline near Glacier National Park and spend a summer day in the treetops. Family-friendly adventure park with high ropes course activities for young children and adults. Glacier Highline is the ultimate aerial adventure experience in the northwest of Montana. The park is made up of a lower and upper high ropes course. Each level has a variety of obstacles to overcome. You’ll be climbing across hanging log bridges and cargo nets, ziplining through the courses, and swinging on the Tarzan Swing. With the 50 high ropes activities, you will be entertained and challenged all day. Glacier Highline is one of two places to zipline near Glacier National Park. Located just minutes from the west entrance to the park, it’s a great activity to get away from the crowds and still enjoy being in nature. Glacier Highline has four ziplines for you to experience. Three of the ziplines are located on the lower level of the high ropes course. The three vary in length, but each has its own thrill. The fourth zipline is located on the upper course, which is 30 feet high. You’ll be traveling over 250 feet to the ground. From there you can make your way back through the ropes course and go for round two of ziplining! Tower Grill restaurant, located near Glacier National Park, is perfect for fueling the adventure through the high ropes course at Glacier Highline. Enjoy a coffee or huckleberry slushie on the picnic tables, or grab lunch next to the pond while the kiddos take their turn on the Giant Swing.